You're probably saying to yourself, "Hey, wait a minute! I don't see any mermaid!" Well, this is not one of those literal pieces, this is one of those artsy pieces where you have to squint and stand back a ways to truly appreciate it (kidding, just kidding - you won't find a mermaid even if you do that, although I would find it amusing). The folks over at the Art Bead Scene Blog sponsor a challenge every month wherein they chooose an image for inspiraiton and challenge you to use an art bead in some way in the creation of a piece. They define art beads as "a bead, charm, button or finding made by an independent artist. Art beads are the vision and handiwork of an individual artist." I love art beads of all kinds and I have lots of favorite artisans. If you've been following my blog for long, you've probably seen some pieces sure to inspire envy. My friend, Lindsay (she's brilliant, by the way - check her work out here) convinced me to keep going. She suggested I add little bits of color, so I went back to the drawing macrame board. I just love it when a plan comes together. This one was a challenge for me in many ways. The colors were not my old standby, comfortable colors and I'm very much a straight line, symmetrical kind of person. Free form is hard for me. I have to work hard to make it look like I didn't work hard! I do free form once in a while (you can see some examples here and here if you're interested), but it doesn't come easily. 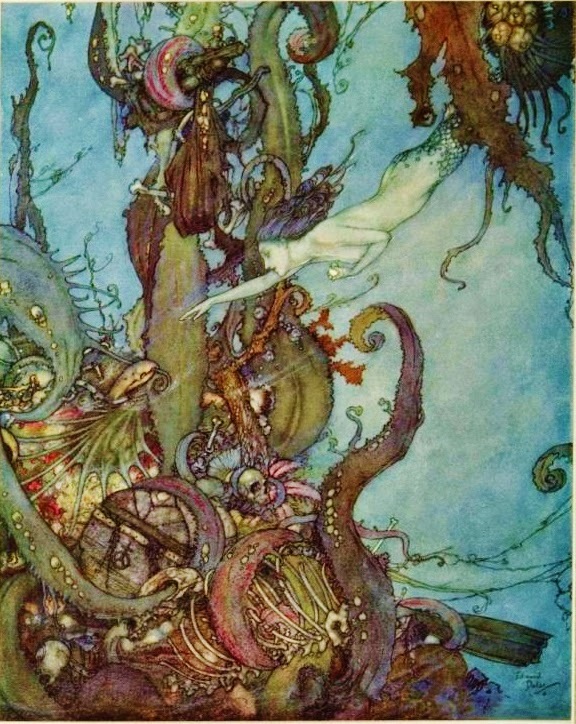 Anyway, with Laurie's bead and Mr. Dulac's illustration for inspiration, it all gelled. I swear I even see a swirl of tentacles, the sweeping fan of a shell and little bits of the tangled sail and mast in the knotting. Maybe even some of the stringy seaweed floating in the deep currents. Are you with me? I am with you, I see it all. Also the subtle addition of the colors in the bead really enhance it. You have created an amazing piece of art. You never cease to amaze. When posed next to the inspiration...your intricate knotted bracelet is a perfect response! The knotting design also references the ancient nautical craft of knotting. Love that the piece is reversible to really show off this amazing lamp work bead! I love it so glad your friend talked you out of ripping it apart, I love the gold..
Oh! I am finally seeing this post~ I didn't know about the inspiration photo~ that's wonderful! The bracelet is amazing and such fun to wear. Also very comfortable.